An international media watch-dog has urged the European Union to withhold aid until 18 journalists held in Eritrea are released. The Paris-based Reporters Without Borders, RSF, called on the EU Humanitarian Aid Commissioner, who is currently visiting the Horn of Africa, to impose this condition during talks with Eritrean officials. RSF says that on 18 September 2001 the authorities closed all privately-owned newspapers and then detained the journalists. "Journalists are still detained in undisclosed locations by the authorities. 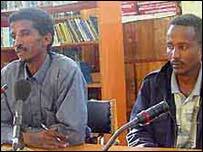 They have not been brought to trial and no official reason has been given for their arrest," RSF said in a statement. It also called on EU commissioner Poul Nielson to tie the resumption of aid to the freeing up of the press in general in the country, which it says is tightly controlled by the government. Naming Eritrea as the only country in Africa without a privately owned news media, RSF also says that foreign journalists cannot operate freely in Eritrea. The press watch-dog says that most other journalists have fled the country taking refuge in Africa, Europe or America. Last year, the international human rights group Amnesty International criticised Eritrea for unlawfully detaining dozens of political prisoners and journalists. 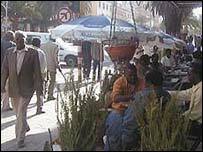 At the time Amnesty said it tried to send a delegation to discuss its concerns with the Eritrean authorities, but their request for visas was turned down. Three former foreign ministers, three army generals and a vice president were accused, before the National Assembly, of committing treason during Eritrea's recent war with Ethiopia. It was alleged that in May 2000 they had offered to overthrow Eritrea's President Isaias Afewerki, if Ethiopia halted its offensive. But this allegation was denied by Anthony Lake one of the peace mediators, to whom the offer was supposedly made, as "utterly false". "We are concerned about the safety of these journalists"